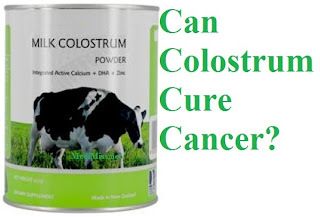 MediMiss Best Cancer Bio Colostrum Cancer cancer colostrum Cancer Cure cancer help cancer solution cancer treatments colostrum colostrum effects on cancer cure cancer Natural Remedies Remedies Can Colostrum Cure Cancer? This is an important question since according to statistics, Americans are quite vulnerable to cancer diseases. Cancer is a disease that's related to immune system deficiency while Colostrum is well known for its capability to increase our bodies' immune systems. Cancer cells are created in body all the time, but our immune systems kill them before they develop further and become hazardous. The development of Cancer cells indicate that our immune systems don't do their job effectively. These Cancer Cells use this opportunity to expand their invasion in our bodies and spread out of control. So in order to fight the Cancer, one should strengthen their defense by boosting the immune system in the body. Colostrum is one of the treatments to help boost the immune system. Colostrum contains the antioxidant phytic acid which prevents iron from reaching and nourishing cancer cells. Alpha Lactalbumin one of the immune in Colostrum can cause Cancer Cells to commit "suicide". Another study emphasized the inhibition of cancer cell growth and induced apoptosis by Interleukin 4, a cytokine found in colostrum. Natural killer cells that are present in colostrum provide resistance against tumors, however these cells have thus far shown minimal cytotoxic activity. Other components of colostrum that can potentially inhibit the process of carcinogenesis are Tumor Necrosis Factor, Vitamin A, Vitamin D, proline-rich polypeptide (PRP), and TGF-beta like peptide. Research has shown that increased levels of IGF-1 in the plasma are associated with an increased risk of prostate and breast cancer. However, studies suggest that the higher levels of this hormone in cancer patients are a result of cancer cells over-producing the insulin-like growth factors, not because of an addition of the hormone by an external source. Although Colostrum has many benefits to Cancer Patients but it doesn't change the DNA. Many humans are predisposed to cancer, and many of us have dormant cancer cells in our body. But however by doing a healthy diet and consuming nutritional supplements such as Colostrum can discourage the proliferation of unhealthy cells. Another interesting study on Colostrum showed that it produces interferon and peroxidase inside the body. These two substances are responsible to dramatic recovery of many cancer patients. While the most interesting part comes from DEDI website. According to this site, a group of researchers from DEDI inject a certain untreatable cancer cells to Cows and then let those Cows produce Colostrum that contains specific antibody to kill these untreatable cancer cells. According to them it seemed to work but needed a deeper research, but when the government through FDA heard about this information they close down the operation. But I cannot validate the truth of this story, I leave it to readers to dig more on this information. So my conclusion is Colostrum has positive impacts on Cancer Patients and can be added to existing cancer treatments. Whether you're suffering from cancer or not, you really should consider to consume Colostrum on regular basis to gain significant improvements to your health. If you're not too sure you'd better consult with your doctor first before taking action.